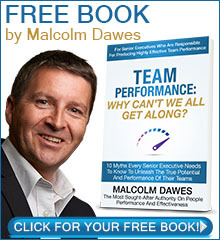 As a senior executive who is measured and rewarded based on the performance and effectiveness of your team, you want and need your team to perform at their very best. As a leader, the pressure on you to get this performance can be significant. At times that pressure can make it extremely difficult to look beyond the obvious to get your team to perform. The obvious is that people seem to get along with each other. The reality is how do you get them to get along with each other?